rec. Ahnensaal, Schloss Weinberg, Kefermarkt, Austria, 3-4 December 2015. This recording is my third of this most enigmatic of works performed on my preferred instrument, the harpsichord. This compares with four on the piano. Each of the harpsichord versions gives me greater pleasure than any of those played on the piano. I find that the harpsichordists are able to convey the differing temperaments of the music to a greater degree giving more emphasis to the diverse shades that Bach built into this work. It is also usual for them to perform the repeats, something not always adhered to by pianists. Of the three versions I have which are on the harpsichord this one from Erich Traxler is the slowest overall. He takes only twenty seconds more than that of my preferred reference recording: Christophe Rousset (Decca 475 7079) but nearly two minutes beyond the time taken by Japanese performer, Takae Ohnishi (Bridge 9357). I once had a friend who reckoned that you could judge a recording of the Goldberg by the transition from the opening Aria into the first variation. Here Traxler stalks the middle ground with Rousset performing the Aria the quickest. Ohnishi is half a minute slower giving a greater emphasis to the tempo change, not that this is everything and I would prefer to judge a performance as a whole. There are particular variations which I prefer performed by each of these performers with each having a lot to say. Traxler is very fine and for me has a slight edge over Ohnishi. He chooses, as does Rousset, to treat the final Air as an apotheosis of the work and both are nearly two minutes slower in this final piece than Ohnishi. This pacing gives a wonderful sense of completion to the work. If asked to select only one recording I would still opt for that by Christophe Rousset. I find his performance to be more measured and he has slightly greater finesse in his playing than Traxler. The harpsichord employed in this recording is a modern copy of an original from 1624. 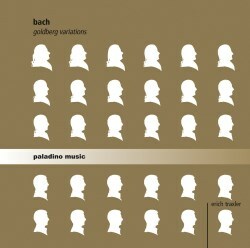 It has an excellent sound that lends itself well to the music of Bach. Often on harpsichord recordings it is the miking of the instrument that lets the recording down; not here. The engineers have positioned the microphones to produce a wonderful sound. The booklet notes are by Traxler himself, and he makes a convincing argument for performing the work in the way that he does. Overall this is a well measured and well recorded performance of what has become a seminal work of the baroque keyboard repertoire.